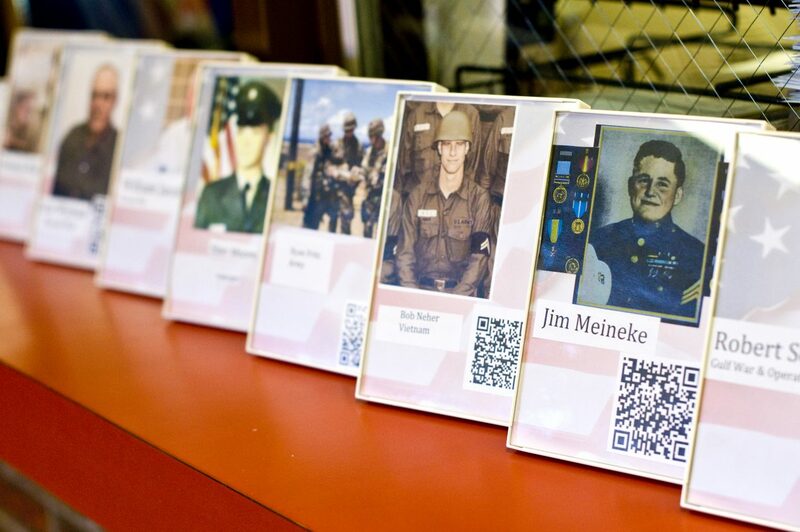 Photographs of area veterans at Sunset Elementary — including Korean War vet Jim Meineke — display codes which link directly to interviews posted online. The photographs will be exhibited at Wyman Museum in Craig on Tuesday, with students on hand from 10:30 to 11:30 a.m. to guide the public through their oral history collection. Sunset Elementary students are not just sitting in the classroom learning about history this Veteran’s Day; they actively are recording it. Moffat County’s youngest historians have created a digitized collection of oral history to share with the community, which will be exhibited at the Wyman Living History Museum on Tuesday. The young historians themselves — one representative from each kindergarten through fifth-grade classroom — will be present from 10:30 to 11:30 a.m. to guide the public through the exhibit, which brings the stories of local, Moffat County veterans to life with the help of modern technology. Sunset students began by inviting selected veterans from the community to their classrooms to share their stories, including vets from World War II, Korea, Vietnam, the Gulf War and Operation Enduring Freedom in Afghanistan. Students prepared questions for the interviews ahead of time, and recorded them using iPads. The videos were then uploaded to YouTube and assigned a QR code, similar to a barcode, which can be read using an app on any smartphone. The veterans’ photographs, each with a corresponding QR code that allows people to instantly scan and link to the interview online, have been on display in the front entry of the school before moving to Wyman. The exhibit will become a part of the permanent collection of the Wyman Museum as a piece of not only Moffat County but also national history. The idea began with Arnett, who engaged her students in a similar project two years ago. One of the Colorado standards for second-graders is to learn the tools of historians, according to Arnett. The project’s ripple effects extend far beyond the initial goal of teaching the students about oral history. According to Arnett, the experience left an emotional impact on many students, who will share their experiences with visitors Tuesday at Wyman. The project also inspired teachers, and perhaps most importantly, made a positive impact on the veterans who shared their stories. For the students, the first-hand experience of history lends them a much deeper perspective than a classroom lesson ever could. The students themselves will assume the role of teacher at the Wyman Museum Tuesday, showing people how to download and use the QR scanner to view the interviews on their own devices. The students will have iPads on hand for those without a device. Sunset Elementary also will host a flag ceremony Tuesday morning at 8 a.m. to honor local veterans, who are invited to attend.